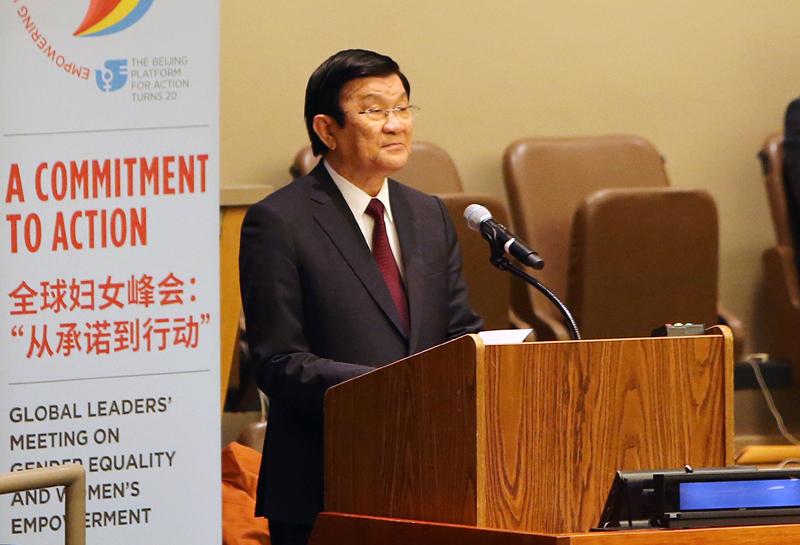 NEW YORK (VNS) — President Truong Tan Sang attended the Global Leaders' Meeting on Gender Equality and Women's Empowerment in New York, the US on Sunday (New York time) as part of his activities at the UN Summit. Addressing the event, the Vietnamese leader highlighted the country's achievements in building laws, institutions and national strategies on gender equality. Gender equality had been mainstreamed in every national development programme and strategy, he declared. According to the President, women account for 48.4 per cent of the labour force, 24 per cent of NA deputies, and 25 per cent of entrepreneurs in Viet Nam. He affirmed the country's commitment to narrowing the gender gap across all sectors, while improving women's access to healthcare services, education, and jobs, especially those in disadvantaged areas. Viet Nam would make efforts to gradually eliminate all forms of violence against women, he stressed, stating that the country would work with the UN and international community in ensuring equality for women worldwide. On the same day, the Vietnamese leader took part in the annual Meeting of the Clinton Global Initiative (CGI) 2015, which saw the participation of over 100 State and Government leaders, 14 Nobel Prize winners and representatives from world leading companies, charitable foundations and non-governmental organisations. President Sang met with former US President Bill Clinton, during which he commended Clinton's contributions to normalising and promoting Viet Nam-US relations over the last 20 years. He also spoke highly of the Clinton Foundation in Viet Nam, especially in providing medical care and treatment for people living with HIV/AIDS, malaria and other infectious diseases, calling for more charitable assistance from the Foundation in the future. Clinton pledged to push for more initiatives aiding Viet Nam's future socio-economic development, disease prevention and response to climate change. At the UN headquarters, President Sang had separate meetings with the Austrian and Chilean Presidents. At the meeting with Austrian President Heinz Fischer, the two leaders agreed to increase exchanges of high-level delegations and business people to foster links in trade and investment. The Vietnamese leader called on the Austrian Government to continue its official development assistance (ODA) provision for Viet Nam. Heinz Fischer praised Viet Nam's Millennium Development Goals (MDGs) implementation, expressing his belief that the country would succeed in reaching the sustainable development goals. He stated that Austria backs comprehensive ties between the European Union (EU) and Viet Nam, promising that the country would urge the EU to quickly sign an EU-Viet Nam Free Trade Agreement (EVFTA). On the East Sea issue, the Austrian President said he supported Viet Nam and ASEAN's stance in this regard and wanted to contribute to maintaining peace, security, and safety and freedom in the sea, which is an important route connecting East Asia and Europe. Meeting with Chilean President Michelle Bachelet, Sang affirmed Viet Nam treasured ties with Chile, and thanked her for her personal efforts to strengthen the relations between the two nations. The two Presidents expressed their joy at developments in bilateral ties, especially after the Viet Nam-Chile free trade agreement took effect in 2014 that helped lift two-way trade to US$890 million. Sang said that Viet Nam and Chile should improve the efficiency of current co-operation mechanisms, especially the Free Trade Council between the two Governments, the political consultancy mechanism the two foreign ministries, and set up new mechanisms towards deepened ties, especially economic links. The leaders concurred that the two countries would continue their close co-ordination and support in international co-operation mechanisms and multilateral forums, especially the UN, and the Asia Pacific Economic Cooperation (APEC).